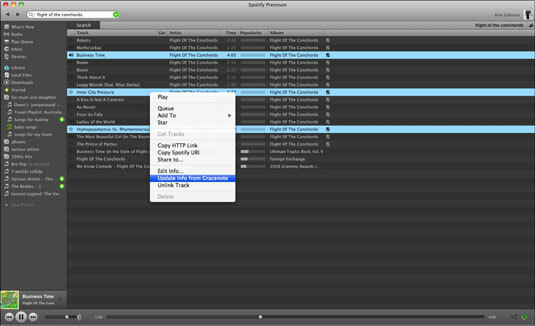 When Spotify first introduced Gracenote integration, listeners expressed a lot of discontent. Spotify automatically updated people’s local tracks by using the Gracenote metadata, which then overwrote people’s unique tags. Luckily, there was an option for people to undo Gracenote’s changes and revert to their original data. Spotify has since abandoned this practice, so updating data by using Gracenote information is strictly optional — and you can still undo changes. For many years, music database Gracenote has been able to identify the CD you’re playing as soon as you pop it into your drive, as long as you’re online at the time. People don’t even know how it happens, it just does. Your computer can connect automatically to Gracenote’s database via iTunes or Windows Media Player. Apart from title, track, and artist, Gracenote includes other information in its metadata descriptions, such as an image of the cover art, the genre (say, R&B), the composer, the mood and tempo, in what era the music was recorded, and so on. But sometimes, you want to have control over editing the information in your tracks (and other times, Gracenote actually doesn’t have the song in its database). Some people don’t always agree with the tags that Gracenote uses, and they want to assign a different genre or description to their tracks. If you manually edit the information in your tracks, you probably don’t want Gracenote to overwrite those changes; particularly if you’ve painstakingly spent hours making them. Click Local Files and browse to the local track or album you want to update. A small rectangle that features a musical note at the end of the track listing confirms that the file is locally stored. Select the track that you want to update. To select multiple tracks, Ctrl-click (Command-click on the Mac) to highlight each of the tracks you want. To highlight large swathes of tracks, click the first track, and then Shift-click the last track. All the tracks in between these two become highlighted. Right-click (or Ctrl-click on the Mac) the name of the highlighted track (or tracks), and then select Update Info from Gracenote in the pop-up menu that appears. The first time you update from Gracenote, you have to agree to its terms, which appear. Read the End User License Agreement, which appears as a pop-up message, and then click I Agree. You need to approve this agreement only once, unless the terms change in the future. Gracenote updates the information for the selected track (or tracks, if you chose more than one). This update may take a few moments to complete. Any corrections are now displayed (for example, if your original track name was misspelled, Gracenote corrects it). If you want to undo the changes, right-click the track again, and then select Undo Gracenote Changes from the pop-up menu that appears. If you keep your digital music within your iTunes Media Library and use iTunes regularly, you should be aware that in rare circumstances, when you update data from Gracenote, your local files could shift location and then be unplayable in Spotify unless you import them again. You can avoid this problem all together by going into iTunes and choosing Preferences→Advanced, and then unchecking the Keep iTunes Media Folder Organized option. This happens because iTunes organizes music in hierarchical folders related to artist, album, and song; and if these parameters change, then Spotify doesn’t know where to find them. But if you don’t take this precaution and your files experience this location shift, you need to import your files again.